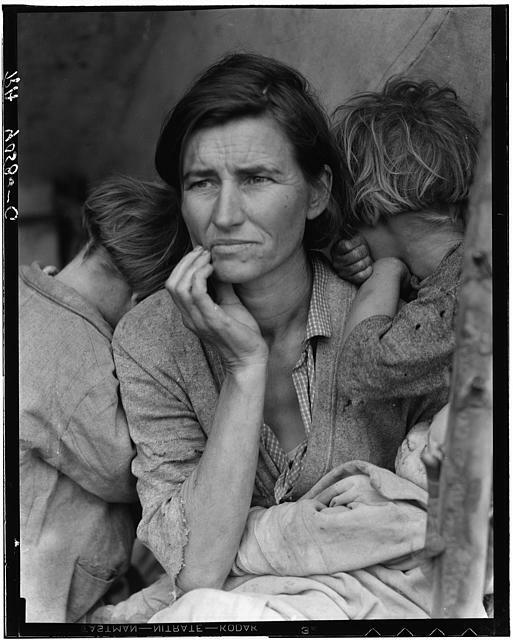 This image is possibly the most recognizable among all of Dorothe Lange's photographs during the American Dust Bowl. The year was 1936, and Lange snapped a picture of Florence Thompson, mother of 10. 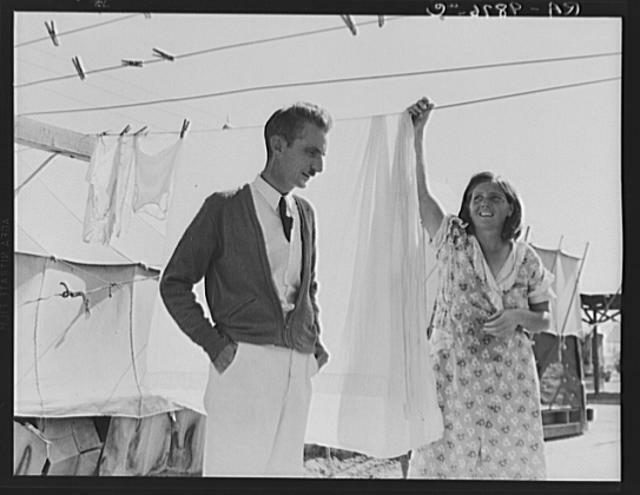 Many Americans simply know her as the “Migrant Mother.” This family moved to California well before the Dust Bowl, but still had to move from one migrant camp to another to support her children. This image reminded Americans that even in the rich Central Valley, there is still hunger and poverty (Buck, 1999). This case relates to John Steinbeck’s The Grapes of Wrath, which took place in the American "Dust Bowl". Literary critics contend that Steinbeck’s piece “continues to be read, not as a piece of literary or social history, but with a sense of emotional involvement and aesthetic discovery” (Davis, 1982 p.7). The story highlights a very real and relatable experience about a family driven out of their home due to economic hardship and drought. Also known as “The Dirty Thirties,” the Dust Bowl was a period of severe dust storms causing major agricultural damage to the American west—especially the Oklahoma panhandle area, Kansas, and northern Texas. Farming methods at the time contributed to the severity of the problem. The arrival of farmers to the Great Plains created conditions for significant soil erosion during naturally occuring periods of cool sea surface water temeratures that regulate percipitation. These methods increased the severety of drought in the Great Plans, and that has contributed to conflict—sometimes violent ones—at a time when this caused massive migration to California. Famers and landholders in the Great Plains had to migrate in the 1930s during a period of drought, irregular rain, and erosion. Dust storms (Table 1) destroyed any hope of maintaining the land. The frontier to the west replaced drought resistane prairie grass, and wheat shriveled. This caused severe dust storms (The Earth Institute, 2011). Many had to head west with little resources as may were forced out of the land (Image 2). Extreme weather conditions during the Dust Bowl or the “Dirty Thirties” was so severe that dust traveled over 1,000 miles from the Oklahoma panhandle. Therefore, the effect of the “Dust Bowl” was being felt in various parts of the country, and problems were not necessarily unique to Midwestern states. A New York Times article on May 12, 1934 had this headline: “Huge Dust Cloud, Blown 1,500 Miles, Dims City for 5 Hours.” Ships 300 miles off the eastern shore even reported dust on their decks. These storms got various nicknames such as “rollers” or “Black Blizzards” (Wineburg, et. al 2013). These were hard times, especially when people had to also deal with a depressed economy. The link between climate change and violence in the Dust Bowl region is not perfect, but it may provide a framework to what is occuring in other parts of the world. As far back as the mid 1920s, San Joaquin Valley, which later became a well-publicized destination for Dust Bowl migrants, was already attracting significant migrants looking for work. The initial migration wave to California was viewed as conventional westward movement. At this time, relatively well-off job seekers in particular took this trek. However, this quickly changed during the Great Depression. The exact scale of migrants is unknown, but it’s estimated that up to 400,000 Southwesterners moved west during the 1930s and up to 300,000 moved into California a decade earlier. The latter group were able to come in relatively unnoticed. Another difference was the social composition. The group who came in later were people of lower socioeconomic class, and came to California due to push factors out of the Dust Bowl. But California looked attractive to desperate Oklahomans. Americans still went to the movies despite the depression and feel-good musicals and comedies all took place in California. The state was already developing a positive image of itself that promised to fulfill dreams. Initially, the depression hit the state hard. 29% of the workforce was unemployed by 1933—same as Oklahoma. California has made significant improvements after President Roosevelt’s New Deal in 1933. It wasn’t long until unskilled laborers in the Midwest heard about a daily earning of $3 to $4. Manufacturing jobs in California also paid considerably more than most states. However, migration was challenging without family ties (Gregory, 1989). This is a case where humans took control of the climate, which arguably made living conditions in the Great Plains worse. The frontiers of farming made the area more susceptible to soil erosion which blew dust that made people sick from dust pneumonia. In other words, this is an example of "terraforming" which modified drought. After the Land Run of 1889, famers changed the landscape that was not ideal for farming to begin with. Agriculture began to expand at the beginning of World War I as demand for wheat skyrocketed. Prices began to fall when the war ended, and farmers trying to stay afloat planted more wheat, which drove prices even lower. Agricultural expansion in the Midwest may have already been a recipe for disaster. U.S. Geological Survey documented as far back as 1900 that much of the southern Great Plains was “nonagricultural” due to low precipitation, and desert like qualities. H.W. Campbell created methods of dry land farming. He believed that this could be successful if agricultural methods were adapted to the region’s climate. Soon, corn was abandoned and replaced with winter wheat as cash crop. The end result was “an extensive effort to adapt agriculture to the land and climate” (Bonnifield, 1979 p.50). This soon became problematic. One scientific farming method was summer fallowing. A farmer required enough land to leave a portion fallow and still produce enough to tide him over until the fallowed land was harvested. Farmers then plow more acres. The idea was to “store one year’s precipitation in the soil to add to the following year’s crop” (Bonneifield, 1979 p.41). This was initially successful but this practice required turning the topsoil, which created an ideal setting for dust storms, as there was nothing to "break the wind". Grass that was adapted for drought protected the soil from erosion, but they were removed. The new approaches lacked new innovations and ideas associated with wind erosion. 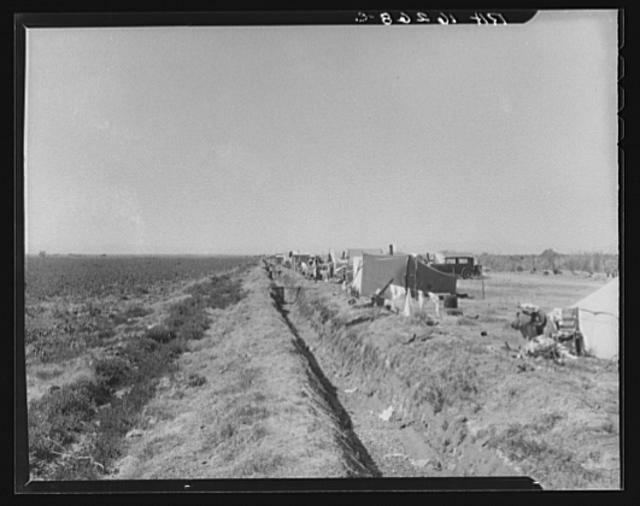 Officials of the pre-dust bowl area figured they were adapting agriculture to the new land. With less precipitation, and drought, the area was ripe for erosion and more dust storms. According to records at the Panhandle A & M College, 1934 was the year of fewest dust storms, and 1937 was one of the worst. These dust storms crossed state boundaries, and Secretary of the Interior Harold Ickes advised Oklahoma homeowners to leave the Panhandle. The image below was taken at Boise City, Okalhomaby Arthur Rothstein. Farming stressed the soil and winds buried vegetation and damaged farmland. There are three soil groups in the southern plains. They range from the chernozem soil, which is most responsive to wind erosion conservation measures. These soils were washed down from the Rocky Mountains from melting glaciers. Eventually vegetation covered the sitting soil. The southern dark brown soils are sandier and will be subject to wind erosion if not properly maintained. These soils are not suited for wheat faming, but that did not stop the Duse Bowl farmers. To prevent blowing, these areas needed to be regrassed in the 30s. The soils in the Dust Bowl region have a characteristic known as “flocculation” which, like fish eggs, causes small soil particles to cling together in clusters. This in short, facilitates the movement of moisture to the subsoil. During droughts,and periods of intense cultivation—which were both seen in the 30s, destroyed flocculation and soil broke down into particles, which were easily windblown. Few farmers understood the need of grassland management. From the late 1800s to early 1900s, farmers were starting to plow more sod than ever before. When wheat crop failed due to drought, the area was subject to wind erosion. Lucky areas that received more precipitation expanded their acreage. Efficient technology contributed to ever more expansion in the 1920s. Increases in total acreage meant less grass to protect against wind erosion. Increased tillage and farming spaces in areas prone to cycles of drought were not conducive to wise land use practices (Hurt, 1981). The duration for this particular case study is during the "Dust Bowl" or the "Dirty Thirties." The exact time period is not clear, but the hardest years that impacted the area was between 1931 - 1939. This decade saw desperate people looking for work. After hearing about opportunities in California, they headed west. The location of the Dust Bowl goes beyond the conventional understanding of the Oklahoma panhandle area. The region of the Dust Bowl was an area most affected by the drought – Kansas, southeastern Colorado, New Mexico, Oklahoma, and Northern Texas. But a much larger areas, all the way to the east coast felt the impact (Weinberg, et al, 2013). One actor involved in this cast study is the Federal Government. The Great Depression generated new programs from the New Deal. Some programs assisted those impacted by the Dust Bowl. Some other actors in this particular case are migrants, coming from Oklahoma, Kansas, Arkansas, Texas, etc. who were poorly treated by farmers and other Californians after their long and hard travel west. Drought and dust storms were the main problems associated with this area. Figures 3 and 4a are based on the Palmer Drought Severity Index (PDSI) coefficients. This Google Earth layer depicts drought between 1870 and 2000 all over the world. This study was most recently updated in 2005 by the National Center for Atmospheric Research. Variations of PDSI have been implemented, but as a whole, this index (Dai, et al, 2004) is intended to study aridity changes in modern and historic climates. 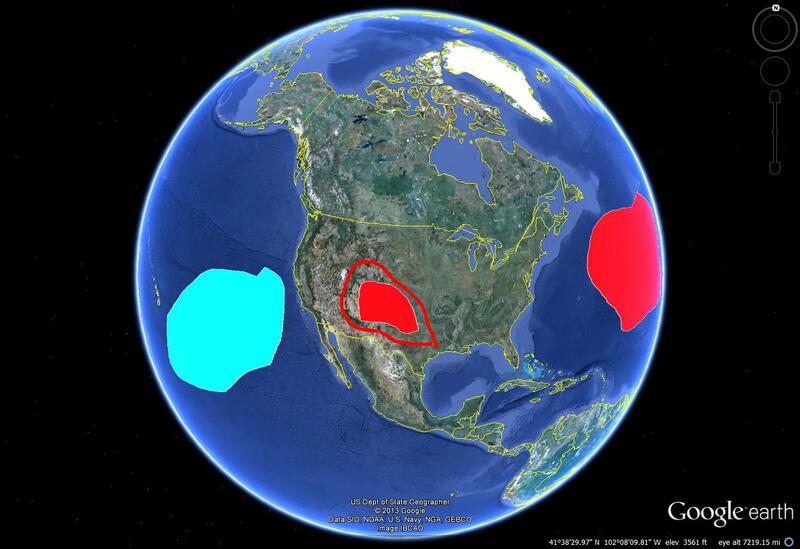 This model used surface temperature and percipitation data to measure drought severeity. 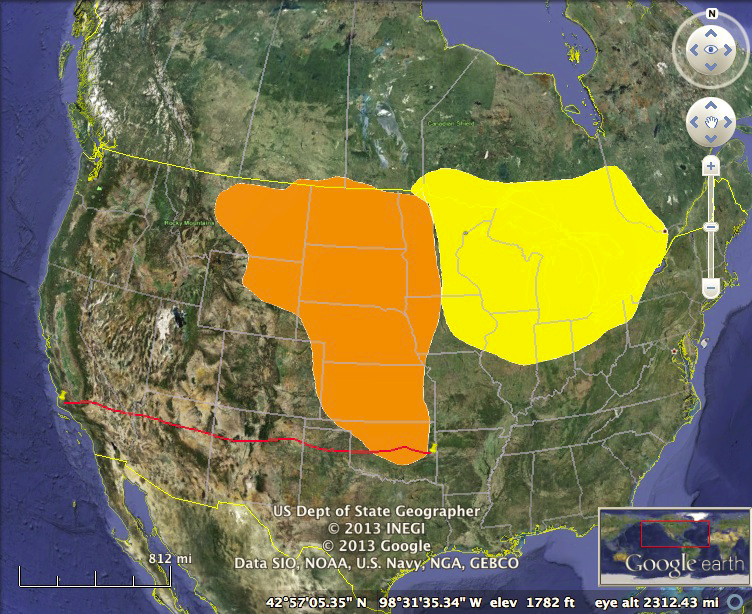 I have used tools in Google Earth to highlight some trends leading up to the Dust Bowl. The PDSI established a model for severity in drought, and relevent regions have been traced from Google Earth. Northwestern United States in the 1920s (highlighted in dark orange on figure 3) was the dryest in the region and the Great Plain states were comparatively less dry. Compare Image 4 and Image 5a to see the changes within a decade. The red line in Figure 5a depicts the route to California. Over one million people left their homes in Oklahoma, Texas, Arkansas, and Missouri moved to California. Today, most of the old Route 66 is closed (Stanley, 1992). Source: Dai, A., K. E. Trenberth, and T. Qian (2004). The year 1935 was driest of dry years in the Dust Bowl region. A warmer temperature, which is the case in the Midwest, enhances the atmosphere’s ability to hold water. The air can hold 7% more water for every 1-degree centigrade. This means, in short more water vapor in the atmosphere. One may expect more moisture in the atmosphere to create more precipitation, but there is more to this correlation. To some extent, water vapor drives weather systems. A moist atmosphere results in shorter but more intense precipitation and floods. Due to its intensity and infrequency, incidence of drought increases, which was the case during a dry cycle seen in the 1930s Dust Bowl region (Mathez, 2009 p. 138 - 141). The economic cost of the of the drought is difficult to estimate dut to its large coverage (60% of U.S.), long duration, and it occurred many years ago. Government financial assistance was equivalent to 13 billion dollars today. Agricultural production fell up to 17% in Missouri, Iowa, Nebraska, and Kansas. However, the nation learned more about the "interactions of climate and agriculture, and land management to control erosion and maintain fragile aoils in dry-land environments" (Sheffield, and Wood, 2011 p.125). To some extent, this reduced impacts of future droughts, like the one in the 1950s. 1935 was the driest in a period that has already seen dry conditions. Spring wheat, if it blew at all was blown away in great dust drifts across the state. Extreme weather caused half a million migrations while suffering from typhoid and other diseases (Hurt, 1981). Studies have shown that droughts are linked to conditions in sea surface temperature of the Pacific Ocean. This alters atmospheric conditions in a way that makes the Great Plains dry when the tropical Pacific is cool. On the other hand, the area is wet when the sea surface temperatures in the Atlantic are warm. This was found to be the case in a NASA study by Siegfried D. Schubert, where state-of-the-art Atmospheric General Circulations Models has shown how sea surface temperature (SST) anomalies can prolong droughts. In short, ocean temperature in the 1930s was unstable, which created and prolonged drought conditions in the Great Plains—it was the La Nina mode of the El Nino Southern Oscillation. The jet streams then reduced the moisture that would have otherwise been transported from the Gulf of Mexico to the Great Plains. The conditions were ripe for a dry climate cycle, which was made worse due to poor farming practices. Droughts historically occur in the region in cycles. Several major droughts, which are often measured with soil moisture, hit the United States in the 20th century. The 1930s and Dust Bowl was followed by the 1950s southwest drought, but there are others expected in the future (Figure 5(b)) (Siegfried, et al, 2004). The Cooler than normal temperatures in the Pacific and the warmer than normal Atlantic "shifted the jet stream to a more southerly location than normal, and reduced the amount of moisture usually transported from the Gulf of Mexico into the central US and the Great Plains" (Sheffield and Wood, 2011 p. 125). Agricultural factors combined with a natural cycle made the dust bowl what it was. As mentioned earlier, the Dust Bowl region has different quality of soils. Sandier soils readily absorb water yet they dry quickly. Clay-like soils will crack in dry conditions. Hard rains are common on the high plains, and men that live on semiarid lands must adjust to the soil. Weather patterns here seem cyclical. Grass spread to “dangerous” areas during wet cycles and was quickly killed when the dry cycle hit “leaving large patches of soil exposed to the wind…the struggle is constant” (Bonnifield, 1979 p.10). Grasshoppers hatch in dry climates and buffalo and cattle overgraze the grass. The Great Plains is ready for dust storms. Research by historian James C. Malin described that severe how dirt storms occurred in the area long before the turn of the century. Reports from missionaries suggests that the climate in the region was already experiencing drought, particularly in the 1850s and 1860s where numerous dust storms were reported. Nature did not provide farmable conditions. During yet another severe drought in 1873-1881 there were reports of more grasshoppers, dust storms and prairie fires. And “in spite of the rigors of the elements, frontiersmen continues to push west.” (Bonnefield, 1979 p.15). A similar case in infestation has occured in the Niger. Source: PDI index from Dai, A., K. E. Trenberth, and T. Qian (2004). Click on the map below for an interactive NASA timeline. Click on the globe for an animation from NASA. Arid climate that was most likely never suited for farming. The region has had wet and dry cycles. In short, dust storms and drought were common. Act Site: Agricultural practices to meet demand. a) Erosion and dust storms that spread to the east coast. Conditions caused mass migration to the west. b) Anti-migrant pushback against Okies that mirrored treatment against the Chinese, Japanese, Mexicans, and Filipino in California. Mostly civil conflict that involved disputes between migrants, law enforcement and landowners. Californians who also treated "Okies" or "Arkies" were responsible for violent conflict as well. Those migrants who had to escape conditions brought on by poor climate combined with inadequate farming had to look for other opportunities by migrating west. The result was not surprising. John Steinbeck was hired by the San Francisco News to document the plight of the migrants, which led him to write the Grapes of Wrath. California farmers who owned 5 – 100 acres of land typically drew migrant workers from what John Steinbeck called “squatter camps” (Image 6). Farmers set aside pieces of land so that workers can make shelter. Houses in these camps are 10 feet by 10 feet and made from paper, which were easily destroyed from heavy rain. Children are already sick from dust pneumonia, and mothers could not breast feed their young due to poor nourishment. If anything goes wrong—car breaking down, the father running late, he will have to feed his family on little or no income. These families could not afford to waste and learned to live within their minimal means. It was not uncommon that family members die on the road, as access to medicine was minimal. Families that were well off suddenly found themselves slipped into low class as the drought hit them hard (Steinbeck, 1988). Powerful speculative farm groups generated cotton strikes where both the workers and the farmers have joined together. Members of these organizations include wealthy individuals who own great tracks of land, or banks and financial institutions that have acquired the land—Bank of America had holdings in the San Joaquin Valley, and Steinbeck described that these farms are “run by superintendents whose policies with regard to labor are directed from above.” Farmers had to obey and answer to those people making loans to them, or run the risk of not getting another loan in the future. Deputies are always on hand, and any disagreement with laborers constitutes “resisting an officer.” Migrants have already exhausted their funds and are continuously in debt. It was not uncommon that disagreements, beatings, and even death occur in these farms due to the power structure of the ranch. Deputies were armed and guarded the gates. Steinbeck described in one article that there was a “constant suggestion that the ranch is armed to fight” (Steinbeck, 1988 p. 38). Anything that resembles congregation was broken up by deputies for fear that they will organize, which is the last thing the owners need. The slightest suspicion would cause these men to “run from the ranch at the point of guns" (Steinbeck, 1936 p.36). They were treated with high suspicion and many owners were expecting revolt to break at any moment. In 1934, the California Bureau Federation formed the Associated Farmers; whose soul purpose was to combat unionization. Migration to California started a series of events aimed against unionization. This succumbed quickly to violent harassment. Because many migrants could not prove residency, they could not apply for state aid, and seeking medical attention was a challenge. To add to the problem, migrants had trouble assimilating. They were frequently treated as an alien social group and were consistently referred to as “Okies” or “Arkies.” The state already socially excluded the Chinese, Japanese, Filipinos, Mexicans, and now fellow Americans they considered economically inferior. The seriousness Californians attached to the migrant issue was highlighted in Los Angeles when Police Chief James Edgar “Two-Gun” Davis set a “bum blockade” deployed 136 officers to 16 major points of entry with orders to turn back migrants. Support for the blockade was strong, but later resulted in legal challenges from the American Civil Liberties Union (Ramussen, 2003 and Gregory, 1989). Fatality levels are unknown due to inaccurate and unavailable recordkeeping. One dynamic of climate change and conflict can be represented in the diagram above (Image 6). As described in previous sections, the dust bowl was caused due to human interference of poor farming practice. Therefore, the ago-environmental factor played a role in increased soil erosion in the Great Plains, which was already suffering from climactic extremes (LoC, 2013). There was evidence that suggested that this area was never meant for people to grow crops and make a sustainable living as a farmer. Nevertheless, spectators still saw opportunity in the land. The Land Run of 1889 “began the disposal of the federal public domain in Oklahoma.” Two million acres were open for settlement. Under the Homestead Act of 1862, a settler could claim 160 acres of public land (Oklahoma Historical Society). But the area goes through cycles of dry weather not ideal for farming. Therefore, climate, decreases land availability because the area was never ideal for farming. Demand for food rose rapidly during World War One, so withing a few dacades, they alrered the landscape. So, farmers tried to meet the demand through agricultural practices such as heavy tilling that prevented the ground from retaining the soil. This caused more erosion in the soil (see previous section). This so called “sustainable production” was not helpful and thus also inhibited land availability. The combination of dry cycles in the climate and “sustainable” production made drought and dust storms more likely. Which eventually caused food prices to plummet, yet farmers were still growing wheat. Finally, these decreased the quality of life for those living in the Panhandle. Farmers were forced off their land because they could not pay back loans to the bank. After years of drought and poor production, many decided to migrate to California. According to Historian Howard Zinn, farmers in Oklahoma “found their farms sold under the auctioneer’s hammer” because the area was no longer profitable (Zinn, 2005 p.389). Tractors took away any property. This was during the Great Depression, and although California promised that they are looking for pickers in the field and hiring workers, they also advertised on the road for Okies to go home because there are not enough jobs. We see a negative feedback loop: People exceeded the carrying capacity of the Midwest. In other words, those living in the Great Plains finally suffered the consequences of inadequate farming and drought followed by the Great Depression. Although California was promising, and may have provided temporary jobs, conflict and anti-migration campaigns were not uncommon. Californians, who had experience with migrants from China, Japan, Mexico and the Philippines in the past had a new target. For many migrants, unemployment was still a reality, and many were still wandering from camp to camp to find work. “Roadside camps proliferated, feeding the resistance to migrant workers that came from many local citizens” (LoC, 2013). There were even reports that vigilantes beat up migrants and burned down shacks. There are no records of specific number of beatings/fatalities from anti-migrant actions. Furthermore, local law enforcement was not helpful either, especially in Los Angeles, where they created a “blockade." (Rasmussen, 2003). 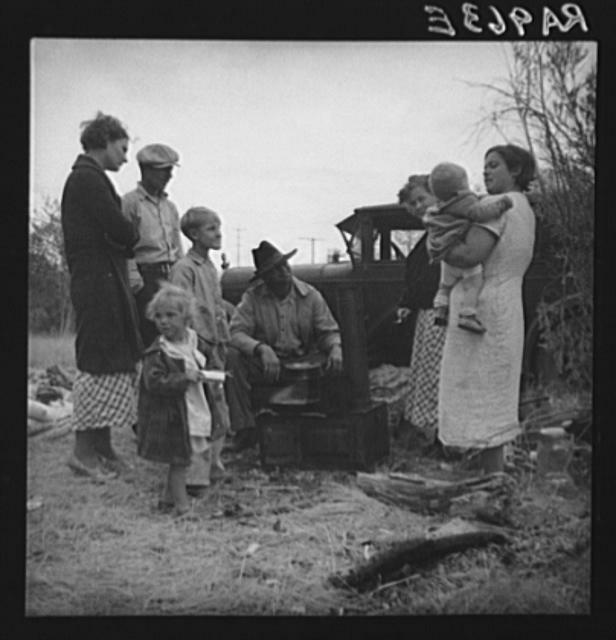 Drought and the Depression were catalysts to the Okie migration. This is depicted well in Steinbeck’s book: “And the dispossessed, the migrants flowed into California two hundred and fifty thousand, and three hundred thousand” (Qtd in Zinn, 2005 p.389). Californians did not want to deal with a migrant problem. 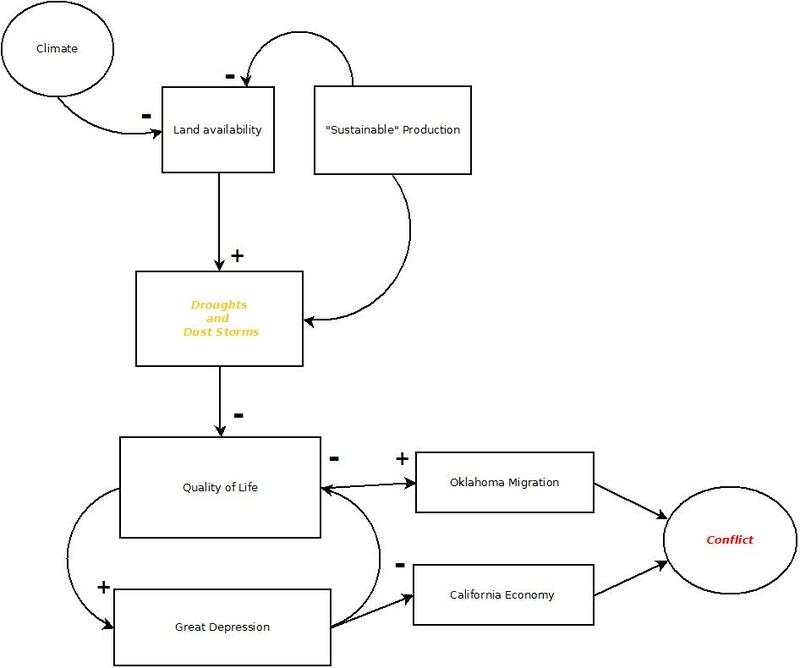 Therefore, as the diagram shows, the California economy met with Oklahoma migration and resulted in civil conflict. Conflict occur frequently when economic conditions are poor, and drought forces migration. This pattern is seen in other case studies (See Related ICE Case Studies). Sub-regional. There was no international interest to the Dust Bowl, but similar themes can be seen in other case studies. Resolved, but midwestern states are still experiencing severe drought and other fluctuations in climate. This region may experience a problem especially as the Ogalla Aquifiers are running dry (Laurence, 2011). The Dust Bowl influenced American culture in important ways. This case study looks at the dynamics of “Dust Bowl” farmers who suffered through harsh conditions of prolonged drought, and dust storms caused primarily by poor farming practices. Human practice in the region has tampered with a dry cycle, propagating the ill effects. These events were depicted in John Steinbeck’s novel Grapes of Wrath. This novel is about a family heading west for better work opportunities after defaulting on loans due to poor crop production: “Fifty cents isn’t enough to get for a good plow. That seeder cost thirty-eight dollars. Two dollars isn’t enough. Can’t haul it all back—well, take it, and bitterness with it” (Steinbeck, 1939) Families, just like the fictional Joads, had to settle for what little they could get. The exerience of this family was not uncommon. Steinbeck experienced first hand what life was like for these migrants. They were victims of discrimination and threats of violence along the way. 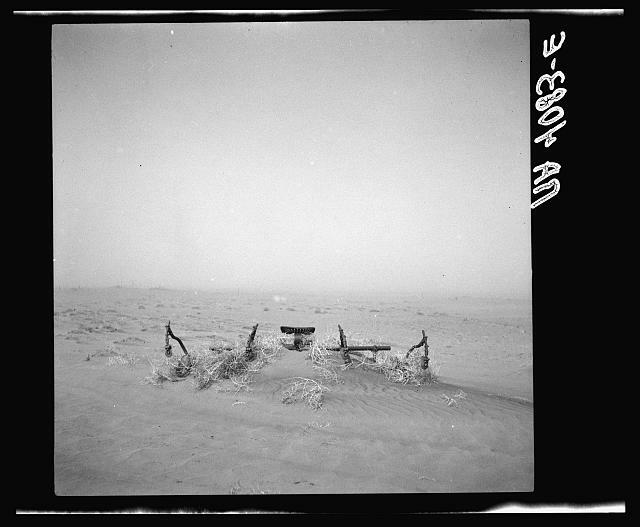 Dorthea Lange took pictures of conditions during the Dust Bowl. Some of her works wer used as a lobbying tool for Congress. 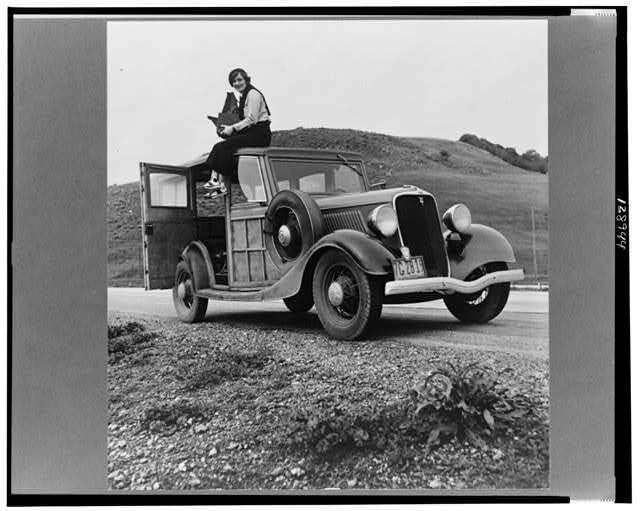 Dorothea Lange (Image 7) took the Migrant Mother (Image 1) in 1936 as part of her work for the Farm Securities Administration under FDR. It was a rainy day in March of 1936 in Nimopo, California. Florence Thomson had many jobs, but Lange saw her at a pea field during her federal assignment. She got some basic information about Thomson. Most of their encounter took place in silence, but she found out that her husband was a native Californian, she was 32 years old and both she and her children "had been living off of the frozen vegetables they found in the fields and the birds caught by children" (Shindo, 1997 p.50). This is possibly one the most iconic images of western American history during the 1930s. The image was first utilized as a lobbying tool. This, along with thousands of other photographs by Lange persuaded Congress to legislate funding to improve the day-to-day conditions of the homeless and jobless throughout the nation (Lange and Henry, 2005). In 1933, Congress authorized the Department of the Interior to launch the Soil Erosion Service. Soil erosion became a national concern, and the federal government began to fund more research that looked at the causes of soil erosion and its potential consequences. This was intended to get farmers the tools they need to curb erosion. In 1935, Congress passed the Soil Conservation Act creating the Soil Conservation Service under the jurisdiction of the USDA. Subsequent legislation supported farmers willing to adopt less-erosive techniques (Napier, 1997). This may have come too late as migration and severe dust storms were already happening. The New Deal established the Resettlement Administration, and its successor, the Farm Security Administration, to assist migrants. The image on the right (Image 8) is of Tom Collins, a friend of John Steinbeck, who worked at a Kern migrant camp. This was also taken by Lange during her assignment. Steinbeck dedicated Grapes of Wrath to Collins "who lived it". Westbrook, director of the Federal Emergency Relief Administration, which later became the Works Progress Administration, allocated $20,000 to establish a migrant labor camp at Yuba County. Local officials campaigned hard against the camp program "arguing that the camps would become a breeding ground for radical and communist activities" (Shindo, 1997 p. 27). Despite opposition, the Resettlement Administration completed the construction of the camp and opened it for business. By December 1935, a second camp opened in other Counties in California (Shindo, 1997). The Works Progress Administration was Roosevelt's major projects which employed millions of unemployed Americans to build roads, bridges, public buildings, and parks. The Federal Government responded to pressures to deal with a chaotic situation that left millions unemployed, and for the first time made a commitment to tackle soil erosion. Conflict as a result of a changing climate can be seen in the developed world. This is a case that may provide context to patterns seen globablly. The ICE case studies below have similar themes in drought, migration and conflict. As seen below similar themes seem to occur all over the world. Bonnifield, Paul. The Dust Bowl: Men, Dirt, and Depression 1979 University of New Mexico Press: Albuquerque. Buck, Claudia "'Migrant Mother:' A Central Valley Legacy" California Journal 30 (6) p.36 1999 LexisNexis. Dai, A., K. E. Trenberth, and T. Qian, 2004: A Global Dataset of Palmer Drought Severity Index for 1870-2002: Relationship with soil moisture and effects of surface warming. J. Hydrometeorology, 5, 1117-1130. URL: http://www.cgd.ucar.edu/cas/catalog/climind/pdsi.html Google Gallaries. Davis, Robert Con Twentieth Interpretations of The Grapes of Wrath Prentice Hall 1982 Print. Earth Institute at Columbia University "Did Dust Storms Make the Dust Bowl Drought Worse?" Lamont-Doherty Earth Observatory. 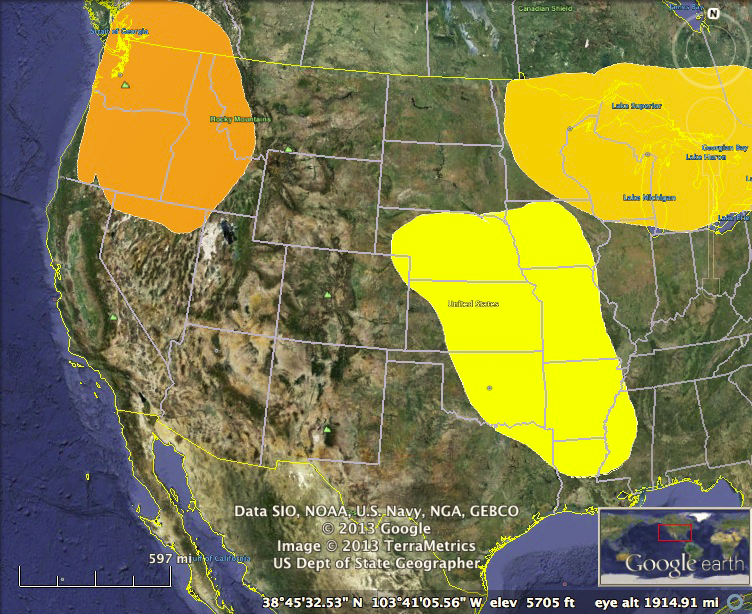 Drought Research http://www.ldeo.columbia.edu/res/div/ocp/drought/dust_storms.shtml. Gregory N. James. American Exodus: The Dust Bowl Migration and Okie Culture in California 1989 Oxford University Press: New York. Hurt, Douglas. The Dust Bowl: An Agricultural and Social History 1981 Nelson Hall: Chicago. Jet Proplusion Laboratory, California Institute of Technology. NASA Climate Timeline http://climate.nasa.gov/interactives/climate_time_machine. Lange, Dorothea and Carole Henry "Instructional Resources: Migrant Mother by Dorothea Lange" Art Education Vol. 48 No. 3 May 1995. Laurence, Charles. "US Farmers Fear the Return of the Dust Bowl" The Telegraph 7 Mar 2011. Web. 6 May 2013. Library of Congress, Prints and Photographs Division, FSA/OWI Collection LC-DIG-fsa-8b29516. Library of Congress, Prints and Photographs Division, FSA/OWI Collection LC-USF34-000963-E.
Library of Congress, Prints and Photographs Division, FSA/OWI Collection LC-USF34- 016268-C.
Library of Congress Prints and Photographs Division, FSA/OWI Collection LC-DIG-fsa-8b27245. Library of Congress Prints and Photographs Division, FSA/OWI Collection LC-USF34-009876-C.
Library of Congress. "Dust Bowl Migrations" Teacher's Guide Primary Resource Set. http://www.loc.gov/teachers/classroommaterials/primarysourcesets/dust-bowl-migration/pdf/teacher_guide.pdf Web. 1 May 2013. Mathez, A. Edmond. Climate Change: The Science of Global Warming and our Energy Future 2009 Columbia University Press: New York. Napier, Ted. "Soil Conservation in Era of Change" Forum for Applied Research and Public Policy; Winter 1997; 12, 4 ProQuest Research Library. Oklahoma Historical Society "LAND RUN of 1889" Encyclopedia of Okalhoma History & Culture. Oklahoma State University Web. 1 May 2013. Rasmussen, Cecilia. "LAPD Blocked Dust Bowl Migrants at State Borders" Los Angelis Times 9 Mar. 2003 Web. 1 May 2013. Schubert, D. Siegfried Max J. Suarez, Philip J. Pegion, Randal D. Koster and Julio T. Bacmeister "On the Cause of the 1930s Dust Bowl" Science Vol. 303 No. 5665 2004 JSTOR. Sheffield, Justin, and Eric F. Wood. Drought: Past Problems and Future Scenarios 2011 Earthscan Washington D.C.
Shindo, J. Charles. Dust Bowl Migrants in the American Dust Imagination 1997 University of Kansas Press: Kansas. Steinbeck, John. Grapes of Wrath 1939 Viking Press: New York. Steinbeck, John. The Harvest Gypsies: On the Road to the Grapes of Wrath Introduction by Charles Wollenberg 1988 Heydey Books: Berkeley. Stanley, Jerry. Children of the Dust Bowl 1997 Crown Publishers, Inc. New York. Weinberg S. Smuel et. al. "Reading Like a Historian: Teaching History in Middle and High School" Teachers College Press New York 2013 Web. Zinn, Howard. A People's History of the United States: 1492-present. 2005 HarperPerennial: New York.